Fresh back from Mexican paradise, it’s time to get back in the healthy swing of cooking. I did enjoy eating most everything I tried in Cozumel, but I often cringed at all the grease and fat in everything. I’ve trained my body to eat foods that will serve as fuel, rather than just store fat and pretty much not do a darn thing for me. Luckily, we didn’t do a ton of high intensity workouts so laying on the beach worked for the food fare we indulged in. I stole this recipe from a friend that also loves this meal-remade from the original high-calorie dish to be lighter and just as delish. It’s my husband’s favorite meal I incorporate with pasta, and usually the kids ask for two helpings. 2. In a medium saucepan, saute the onion and garlic in olive oil until tender. Add 1/2 cup water, tomatoes, sugar, salt and pepper. Bring to a boil and continue to simmer for another 10 minutes or until it reaches desired consistency. Stir in the fresh basil and set aside to keep warm. 3. Using the flat side of a meat mallet, flatten the chicken between two pieces of plastic wrap until they are about 1/4-inch thick. Remove plastic wrap. 4. In a shallow dish, combine the bread crumbs, dried basil, oregano and garlic. In a small bowl, beat together the egg white and milk. Dip the chicken in the egg mixture and roll in the bread crumbs. 5. Place the coated chicken pieces on a greased baking dish and bake at 350 F for 20-25 minutes or until the juices run clear. Transfer chicken to a plate. 6. In the same baking dish, layer the bottom with the cooked spaghetti and mix in half of the sauce. Top with the baked chicken and pour the rest of the sauce over the chicken and pasta. 7. 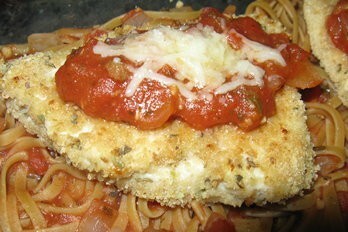 Sprinkle Parmesan cheese over the chicken and put back in the oven for another 5-7 minutes until the cheese melts. Previous PostHere We Move Again – Leah’s Move #10!